To prepare the vinaigrette: Place all ingredients except oil in the bowl of a food processor or in a blender. Process until combined and celery is puréed. With machine running, add oil in a slow and steady stream. Blend until emulsified. Refrigerate to chill before serving. If dressing separates, shake well or re-process in food processor. Store any remaining dressing in refrigerator for up to one week. To prepare the pecans: Preheat oven to 350°. In a bowl, combine pecans, butter, sugar, cayenne, salt and pepper. Stir until nuts are coated. Spread out on a baking sheet and bake for 10-12 minutes or until lightly browned. Set aside to cool. To prepare the salmon: Season salmon with salt and pepper. Heat 2 Tbsp of olive oil and 1 Tbsp of butter in a large nonstick skillet over medium high heat. 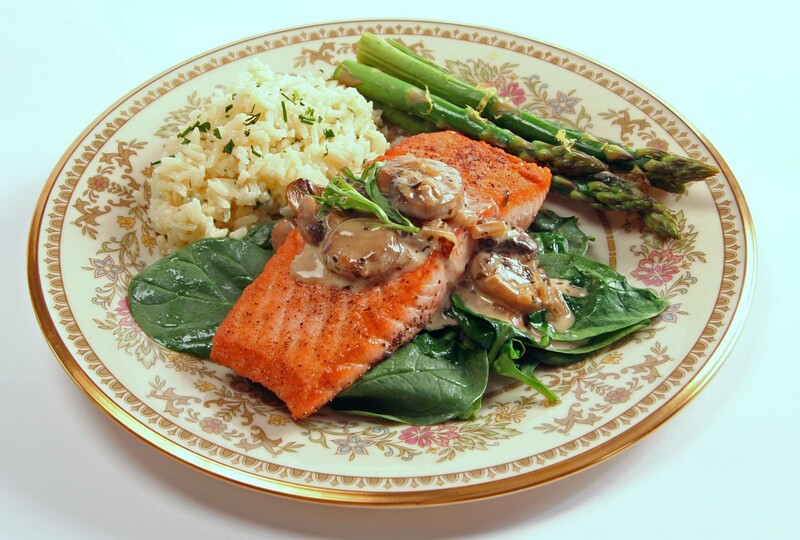 Add salmon, presentation-side down (or skin-side up), taking care not to crowd the pan; depending on the size of your pan, you may need to cook in two batches. Sauté until golden brown, about 2-3 minutes, turn, and continue to cook until done, about 3-4 minutes longer. Remove salmon to a platter. Cover and keep warm, reserving the skillet for the spinach. OR, to prepare in advance, brown the salmon on each side (not cooking completely). Remove from skillet and place on a baking sheet and refrigerate. Remove from the refrigerator about 30 minutes before serving. Bake at 350° about 10 minutes to heat and cook through. To prepare the spinach: A few minutes before serving, prepare the spinach. Heat the same skillet used for the salmon over medium high heat, adding more olive oil if necessary (there should be a light coating of oil covering the bottom of the pan). Sauté the shallots and tarragon for about one minute until the shallot is translucent. Add spinach and turn with tongs just until wilted. To prepare the sauce: In another skillet, NOT nonstick, heat the olive oil and butter over medium-high heat. Add shallots, mushrooms, and tarragon, then sauté until mushrooms begin to brown. While stirring, add wine to de-glaze the pan then simmer uncovered until reduced by half. Add cream, taste for seasonings, and simmer until slightly thickened. To serve, mound spinach in plate, top with fish, and ladle sauce over the top. Melt butter in a medium saucepan. Add rice and lemon zest, stir to coat, and cook, stirring often, over medium heat for about 5 minutes. The rice grains will become opaque, but not browned. Add hot broth and salt (why hot broth? It doesn’t cool down the pot, which would increase the cooking time). Reduce heat, cover, and simmer for about 20 minutes until liquid is absorbed. Stir in lemon juice and heated cream. Increase heat slightly and stir until most of the cream has been absorbed. Stir in fresh herbs. Serve immediately. Make Ahead Tip: The day before, prepare the rice with the lemon zest, broth and salt and directed. Cool, put into a microwave safe container, and refrigerate. Before serving, heat in microwave, stir to “fluff”, then add lemon juice, hot cream and fresh herbs. To prepare the crust: Preheat oven to 375°. Line a 9-inch removable bottom tart pan with the crust and line with parchment. Fill with pie weights or dried beans and bake 15 minutes. Remove parchment and weights. Return to oven and bake 5-8 minutes more until golden. Cool. 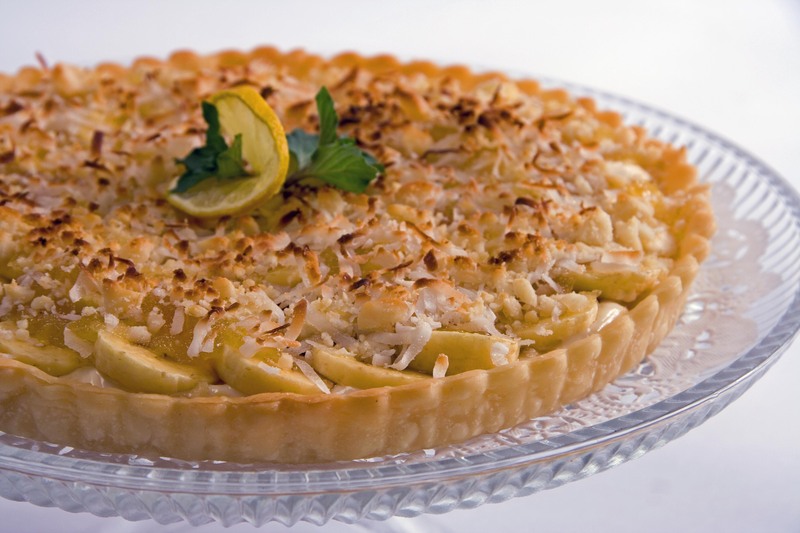 To prepare the filling: Beat together the cream cheese, sugar, vanilla, lemon zest, and lemon juice until smooth. Spread mixture evenly over the bottom of the cooked and cooled crust. To prepare the topping: Preheat the broiler. In a small saucepan or in the microwave, melt the preserves with the grated gingerroot. Thinly slice the bananas and arrange decoratively over the cream cheese filling. 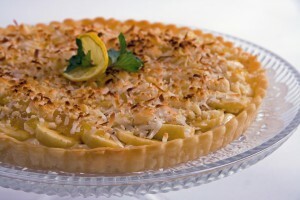 Brush with the preserve mixture and sprinkle with the macadamia nuts and coconut. Broil until nuts and coconut are golden, 2 to 3 minutes. Watch carefully, as the coconut can burn! Refrigerate tart and chill completely, about 2 hours. Slice with a sharp knife, wiping the blade between the cuts. Garnish with lemon slices and fresh mint. Store remaining tart in refrigerator. Claim your copy of The Dining Diva's Kitchen Essentials and the DivaLicious News by simply entering your name and email address.